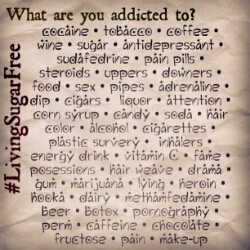 Try #LivingSugarFree from non-essentials one day a week. Start with the thing you think you can't give up (coffee addicts, this means go a whole day without and be nice anyhow, just as you would expect a crack addict to do). *Air, water, nutrition, and love (expressed not received) are essential. Just because it's legal and/or prescribed or over the counter, doesn't mean you're not addicted or that it's "good for you." Don't let legislation, or lack there of control your wellness.